Come prepared to have fun with the Chinese Auction and then some other fun things: eat, drink, laugh, sing and dance. 18" x 22" (fat quarter size). Come ready to vote on your favorite Holiday Quilt. Luncheon Speaker, Sue Nickels, a national teacher who has been quilting for over 30 years, won many wards, published books and has published in various magazines. Taking a class with her is both great for our quilting repertoire and a big honor. Even though there may a few things repeated in both classes; this is a great opportunity to build up your machine quilting techniques and learn from an expert and dynamic quilter. February 8 -- Log Cabin Relays: Can you build a LOG CABIN faster than Honest Abe? Join in the fun for this Scrap-Buster activity! We will sew our own traditional Log Cabin blocks in relay teams. Participants will form teams of 4 to piece log cabin blocks going round-and-round, and using grab bag strips. What to bring? Sewing machines and tools. Fabrics: Collect LOG fabric strips in lights and darks that are 1½ inches wide and at least 12 inches long. Separate lights and darks into two small bags that will sit up, such as paper bag or gift bag. Also bring your Log Cabin Centers in a bright medium color, such as traditional red. enter size: either a 3-inch square or rectangle 2½ x 3½ inches. Please bring only pre-washed fabrics because you will be sewing upon your teammates' blocks. Loose-bundle each strip and secure with one safety pin to avoid tangles in the bag. There’s no cost to participate for guild members. 1. Girl Scouts of the USA Birthday, March 12, commemorates the day in 1912 when Juliette Gordon Low officially registered the organization's first 18 girl members in Savannah, Georgia. Local girl scouts, leaders, and family members will be our invited guests to honor the Girl Scouts birthday, and to encourage the girls in their quilting education. Our Ocean Waves member and Scout professional, Sharon Krutulis, who is the Volunteer Support Service Coordinator for the local Council of Tropical Florida, will speak about scouts’ activities related to quilting. Scouts will offer Ocean Waves a Show & Tell presentation of the quilting work they have accomplished. Were you ever a Girl Scout? Ocean Waves members who were Girl Scouts will be honored with a friendship pin-exchange with the scouts. DEMOS. 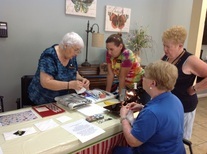 As in previous years, some Guild members will offer short demonstrations of quilt-making techniques at table stations. Observers will circulate around the room at a timed sequence. Please volunteer to give a demo that may be helpful to scouts and beginning quilters. To help please contact : April Atlas at april_atlas@bellsouth.net. 3. March is National Women's History Month Celebrating Women of Character, Courage, and Commitment.